As a child, Alberto Correggioli was blessed to be raised in a loving Christian home. He went to Mass every Sunday, attended Catechism classes and served as an altar boy. He felt an enthusiasm for everything that had to do with his Catholic faith. Then in 1943, Alberto lost his dear mother. It left a great void in his heart. His father now had the responsibility of raising three children all by himself. He did the best he could, but it was difficult for him to try to fill the role of both father and mother. In July 1951, when Alberto was twenty years old, he made a trip to San Giovanni Rotondo with Graziella and her mother. By that time, he and Graziella were engaged to be married. In San Giovanni Rotondo, Alberto felt a calmness and tranquility that was healing to his soul. As he described it, “every corner of the little town was filled with peace and serenity.” Great was his joy when he found himself standing in front of Padre Pio. He made his confession to Padre Pio and received his paternal blessing and absolution. He asked Padre Pio to accept him as his spiritual child and he agreed to do so. Alberto spent seven days in San Giovanni Rotondo and for seven days he was, as he described it, “enraptured.” He found his faith once again as well as a desire to go forward with his good resolutions. It reminded him of the way his life had been when he was a child, when his dear mother was there to guide him and hold him by the hand. After his confession to Padre Pio, he walked outside and stood for a while in front of the church. He was surrounded by an intense fragrance of flowers. He felt that he had been reborn. In July 1949, twelve-year-old Vincenzo Di Lello suffered a life-threatening illness. One very hot day, when he was near the beach, he was overcome by thirst. Even though his brother warned him not to do so, he drank from a nearby well. As it turned out, the well was contaminated, and Vincenzo became sick with typhoid fever. The disease was spreading like an epidemic and many people died that summer. The doctor prescribed penicillin and perfusion treatments but Vincenzo’s condition grew worse. He had a dangerously high fever and was literally wasting away. Seeing his rapid decline, his doctor told the family that there was very little hope of recovery. It was then that his father decided to go to San Giovanni Rotondo to ask Padre Pio for his prayers. On August 14th while Vincenzo’s father was in San Giovanni Rotondo, his family ordered his coffin and bought the white fabric to make his burial gown. The next day, his relatives were all gathered at his bedside. He had already been unconscious for a number of days when his family heard him call out to Padre Pio in a loud voice. Suddenly, a strange perfume invaded the hospital room. On that same day, his father had been received by Padre Pio who said to him, “You may go now. Your son is going to get better.” From that day forward, Vincenzo’s health improved and at the end of August, after two months in bed, he was able to get up. 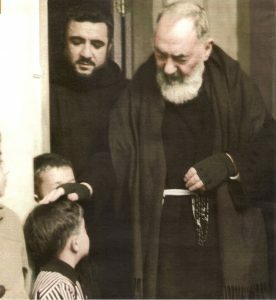 Thanks to Padre Pio, he was able to resume all of his normal activities. Padre Pio told Giuseppe that during his stay, he wanted him to attend Mass each day at the monastery church. Giuseppe was happy to do so. Finally, after twenty days, Padre Pio told him that he could return to his home. “During the twenty days that I was in San Giovanni Rotondo, Padre Pio spoke perhaps only thirty words to me,” Giuseppe said. “His words were clear, concise and filled with wisdom. They contained a complete spiritual program for me to follow for the rest of my life. I cherish his every word in my heart like a treasure.” When Giuseppe returned to Rome, he was renewed in body, mind, and soul. Maria Mazziga traveled to San Giovanni Rotondo in July, 1947. Her intent was to ask Padre Pio to pray for a member of her family who was seriously ill. Maria had been told that many people who asked Padre Pio for his prayers were helped. She was skeptical about a positive outcome but she felt she had no place else to turn. From the time Maria left for her destination, everything seemed to go wrong. The only lodging that she was able to find proved to be a great disappointment. For one thing, there were no private rooms available. Everyone had to double up with complete strangers. It was the practice of the manager to carry pails of water to the rooms for the needs of the guests. Unfortunately, even the most ordinary comforts were unavailable. Early the next morning, Maria waited in front of the church of Our Lady of Grace for the doors to open. She was disheartened by the boisterous and irreverent conduct of some of the pilgrims. “Why must I endure all this misery,” Maria said to herself. Later in the day, Maria decided to get in the confessional line. As she waited, she felt so weak and exhausted that she was afraid that she might faint. All of a sudden, she was surrounded by an indefinable wave of perfume. The scent seemed to revive her. Maria had heard about the perfume that was associated with Padre Pio but considered it nonsense. Nevertheless, she could not deny the fact that her bodily strength had suddenly returned. As the perfume lingered in the air, she continued to feel stronger and stronger. In the confessional, Maria told Padre Pio that one of her relatives was very ill. “I will pray for that poor girl,” Padre Pio said. Before Maria received absolution, Padre Pio told her to pray the Rosary for her penance. She did not own a Rosary but was able to acquire one in town. When she took it to Padre Pio and asked him to bless it, the same wonderful fragrance wafted from it that she had experienced while waiting in line for confession. “This is a fragrance from Heaven,” Maria said to herself. “Padre Pio is a favored soul who has been sent to us by God.” From that moment forward, she felt close to him. Through contact with Padre Pio, Maria’s faith was reawakened along with a renewed desire to pray and to attend Mass daily. She experienced, as she described, “a whole new world.” Her life was no longer empty. Shortly after, her relative who was ill made a complete recovery. In 1939, Angela Morano traveled from her home in Calabria to San Giovanni Rotondo. Even though she was young, she was thinking seriously about her future and she wanted to consult with Padre Pio about several marriage proposals she had recently received. At that time, there was only one boarding house in the area that was near the Capuchin monastery and Angela was happy that a room was available for her. Angela told the landlady of the boarding house that she planned to ask Padre Pio advice regarding the difficult choice of a marriage partner. “Padre Pio is able to help people because he is in communion with God,” the landlady responded. “Trust whatever he tells you because he is enlightened,” she added. The next day Angela was able to make her confession to Padre Pio and at the end she said, “Several men have asked me for my hand in marriage but I am afraid to make the choice. I would like you to advise me as to which one might be the most suitable partner.” “I am not a fortune teller,” Padre Pio replied. “Pray to the Holy Spirit for guidance,” he added. With that, he closed the little shutter in the confessional making any further dialogue impossible. Angela was hurt by Padre Pio’s words and was not able to hold back her tears. She left the confessional quickly and returned to the boarding house. When she told the landlady what had happened, she heard encouraging words. “Sometimes Padre Pio is brusque. Think nothing of it. Just be persistent and you will get your answer,” the landlady said. Angela returned to Calabria and after a number of months passed, Padre Pio’s words began to materialize. The family of Giovanni Rispoli contacted Angela’s mother and asked permission for Giovanni to meet Angela. Giovanni was an attorney who had been working in Asmara, Africa and had recently returned to Italy. Angela and Giovanni were formally introduced and got along well from the very beginning. Angela told Giovanni about Padre Pio and all that had transpired on her visit to him. She wanted Giovanni to meet Padre Pio and invited him to make a trip to San Giovanni Rotondo with her. In order to please Angela, Giovanni was willing to make the trip, but he was not looking forward to it. He was very skeptical about Padre Pio. He had once been a practicing Catholic but after his father died, his faith diminished to a great extent. The grief he felt at the loss of his father overshadowed everything else in his life. He finally became completely indifferent to religion. In San Giovanni Rotondo, Giovanni attended Padre Pio’s Mass with Angela but he was unimpressed. After the Mass, he followed Padre Pio into the sacristy. Padre Pio greeted him and said, “Giovanni, I see that you have landed here.” Giovanni was shocked that Padre Pio knew his name. He was also shocked that Padre Pio seemed to know that he had been away from his native soil of Italy. He felt confused and remained silent, not knowing how to respond. “But, isn’t your name Giovanni?” Padre Pio asked. “Yes, that is my name,” Giovanni replied. He told Padre Pio that he had been in Africa when he learned that his father had passed away. “I cannot resign myself to losing him. I cannot get over the grief,” Giovanni said. “Continue on the straight road and you will find your father again,” Padre Pio replied. The words restored peace to Giovanni’s heart. Giovanni then told Padre Pio that his mother had introduced him to Angela and hoped that he would ask her for her hand in marriage. “You two are made for each other,” Padre Pio replied. “I think you should marry her,” he added. “But war is about to break out and I could be called up for military duty at any moment,” Giovanni answered. “The war will not touch you,” Padre Pio said. 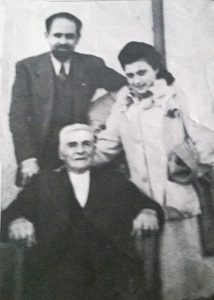 1940—A photograph of Mr. and Mrs. Giovanni Rispoli with Padre Pio’s father, Grazio Forgione. Angela and Giovanni were married in 1940 and soon after, Giovanni received notification that he was to report for military service. When he presented himself at the recruiting office, he was told that another man had been substituted in his place. He would not be required to serve in any capacity. He remembered that Padre Pio had said, “The war will not touch you.” As Giovanni thought about all the accurate statements Padre Pio had made to him about his life, his attitude changed and he began to have great faith in him and in his prophetic gifts. Some time later, Angela was struck with a terrible pain. The doctor told her that an operation might be necessary. “But why is there talk of an operation?” Padre Pio said to Angela. “You are expecting a baby!” Angela and Giovanni were elated. “What shall we name our baby,” Giovanni asked. “Name the first ones whatever you want. You can name the last one after me.” Angela and Giovanni became the proud parents of a baby boy. Two more boys followed and were welcomed with love. Six years later, Angela became sick and asked a friend who lived in San Giovanni Rotondo to tell Padre Pio that she was unwell. “I am aware of Mrs. Rispoli’s illness and I will take care of it,” Padre Pio said. It seemed as though Padre Pio was Giovanni and Angela’s good guardian angel, always watching over every aspect of their lives. In 1956, Angela and Giovanni’s first daughter was born and six years later their last child was born, a beautiful baby girl whom they named Pia. Father Antonio Cannavacciuolo of Latium, Italy, was ordained to the priesthood on December 20, 1919. Shortly after his ordination, he traveled to San Giovanni Rotondo for the first time. He was received affectionately by the members of the religious community who resided at Our Lady of Grace monastery and was invited to share a meal with them in the refectory. When asked if he would like to stay overnight, he readily agreed and was assigned a little cell not far from Padre Pio’s. That evening, he met with Padre Pio, made his confession to him, and felt blessed to be able to kiss his hand. Father Antonio returned to San Giovanni Rotondo in 1946. After that, he visited Padre Pio two or three times each year. He remembered the affection with which Padre Pio always received him and he recalled with great joy, Padre Pio’s paternal embraces and kisses on his cheeks, according to the Italian custom. In 1955, Father Antonio came down with a very bad case of laryngitis and could barely speak above a whisper. He tried a variety of medicines, but nothing helped. He remained in that state for six months. To make matters worse, he had no one to assist him at his parish. He had to preside at the Mass, hear confessions, ring the bells, play the organ, sing, and preach all by himself. With his many responsibilities, he felt a growing anxiety about the loss of his voice. Finally, Father Antonio decided to make a trip to San Giovanni Rotondo in order to ask Padre Pio to pray for his recovery. At the monastery, he greeted Padre Pio, kissed his hand and then explained that he had been suffering from chronic laryngitis. Padre Pio gazed at him a few moments in silence. He then slapped Father Antonio’s throat with the palm of his hand. Father Antonio’s voice suddenly returned, as though nothing had ever been wrong. He never had trouble with laryngitis again. 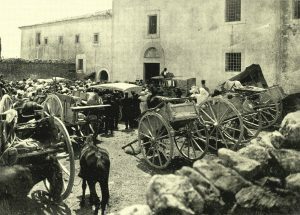 In the early days, the pilgrims traveled to Padre Pio’s monastery in horse-drawn carriages and then later in automobiles. Through the years, Father Antonio remained a dedicated and fervent parish priest. He observed that many of his fellow priests looked much older than their years. He often wondered why so many priests seemed to age prematurely. Father Antonio felt strong and energetic and prided himself on his good health. When he traveled to San Giovanni Rotondo in 1964, Padre Pio said to him, “Do not brag about your youthful appearance or your health. You too will feel the approach of old age.” In less than a year, Father Antonio began to feel ill. Finally, he was admitted to Padre Pio’s hospital, the Home for the Relief of Suffering and spent fourteen days there where he was treated for a heart condition. For many years, Father Antonio organized and led pilgrimages to the monastery of Our Lady of Grace. He offered a Mass every week for the intentions of Padre Pio and he prayed to him continuously. When Father Antonio grew old and infirm, he said that the only reason he was able to continue to perform his priestly duties was because of Padre Pio’s prayerful intercession. Father Antonio made his last pilgrimage to San Giovanni Rotondo in 1978. He died suddenly, several months later, just after celebrating Mass. He was 88 years old. The best preparation I can make for death is to live the reality of the Paschal mystery as fully and as deeply as possible in union with Christ, because Christ will re-live that mystery in me at the hour of my death. If I am following the spirituality of the Paschal mystery, I expect to die and rise again many times in the course of my monastic life, in my daily tasks and duties, in unexpected events and circumstances, and in my life of interior prayer. . . I expect to have to let go and give up again and again, discovering a new richness of life each time. . . I will learn to trust more and more this Father into whose hands I shall one day, freely and gladly, hand over my life. On that day my final act of dying will be inserted irrevocably into the saving death and resurrection of Christ my Lord. – Father Charles Cummings, O.C.S.O.